Pond in Patmore Heath Nature Reserve, Albury, Hertfordshire. An interpretation board on the site explains, "Patmore Heath NR is probably the best remaining example of acid grass heath in Hertfordshire. Very few heaths like this still exist in England today." 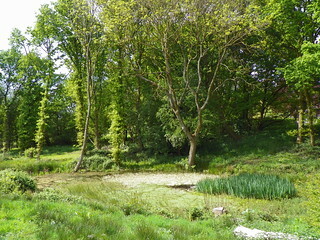 The site was grazed until the 1930s, after which it started to be invated by scrub and trees. These trees threaten the ponds on the site by absorbing water and shading out the ponds and marginal plants. Therefore, the site is managed with grazing animals having been reintroduced. GOC Hertfordshire's walk on 14 May 2016, in and around Furneux Pelham, Brent Pelham and Stocking Pelham, Hertfordshire. David W led this 10.2-mile walk, attended by 16 people. You can view my other photos of this event, read the original event report, find out more about the Gay Outdoor Club or see my collections.